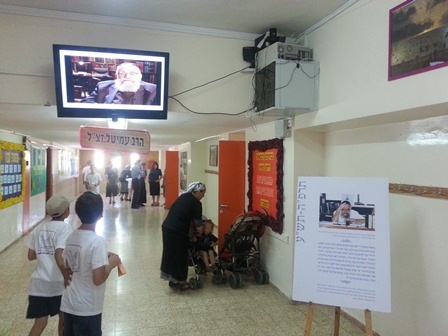 The local Gush Etzion elementary school , celebrating its 40th anniversary, re-named its upper boy’s division “Carmei Yehuda” (Yehuda’s vineyards) in memory of HaRav Yehuda Amital zt”l, where 15 of his grandchildren studied. There are 450 students in the school and many of the parents and educational staff, past and present, were students of HaRav Amital. The school hopes to maintain close cooperation with Yeshivat Har Etzion, which it considers a model for its educational goals, and has already started an educational program this year for grades 7-8 with the Roshei Yeshiva, Rav Amihai Gordin and Rav Nadav Caspi, program coordinator. Speaking at the naming ceremony which was held on June 12th, in the presence of Rav Gideon Perel, Head of the Gush Etzion Regional Council Davidi Perel, School Principal Rav Menahem Landau, rabbis, teachers, parents and students, Tali Brin, daughter of HaRav Amital, teacher in the girls’ division and former principal of the boys’ division, spoke about her father’s special love of children throughout his life. “My father believed in his students and wanted each of them to have his own thoughts and opinions. He valued independence, creativity and self-expression,” she added. Daniel Shai, grandson of HaRav Amital, lit a torch on behalf of the Amital Family. This is the second school to be named after HaRav Amital; the first is in Har Choma, Jerusalem.